During the 2018 offseason, Justin Mason of FanGraphs and Friends With Fantasy Benefits organized a new industry league, The Great Fantasy Baseball Invitational. TGFBI is a series of 5x5 15-team mixed league setup with one C position and two UT positions per team. During early March, 195 fantasy writers were distributed into 13 different leagues and slow-drafted their rosters. As with the NFBC Main Event, Mason also set up an overall competition component in the event. The overall standings were compiled from 195 points to 1 point for each of the ten fantasy categories. Fourteen BaseballHQ.com writers enterered the competition across the 13 leagues, and came home with five first-place finishes and a pair of 2nd-place finishes. Ryan Bloomfield: I employed my typical strategy of drafting well-rounded, high-floor guys early, and then speculating on upside in the mid/late rounds. The first part worked fine, but I had too many misses in the middle rounds and failed to hit on a second closer, which hurt my depth and drained my early FAAB. Ray Murphy: I was slotted in the 14th spot in the snake, and opened with Corey Kluber as my first pick. That should have put me in a hole building my offense, but some later picks panned out for me to recover that missing first-round hitter value. (Murphy's offense finished 25th overall in TGFBI). Within those draft strategies, BHQ owners found sources of profit. Thanks to Stephen Nickrand's UP: 25 HR, 25 SB for Christian Yelich in the 2018 Baseball Forecaster, several HQ teams rostered the OF in the third/fourth rounds. There were a handful of HQ owners that selected Jose Ramirez in the second round, and Javier Baez (UP: 30 HR) and Trevor Story boosted BHQ offenses. Even though it took him a bit to get started, Amed Rosario was another infielder that turned a profit for several BHQ owners from a later round pick. With an "UP: Cy Young talk" from the 2018 Baseball Forecaster, Jacob deGrom anchored several BHQ staffs. Gerrit Cole, as a fifth round selection, provided a strong foundation for ratios. When looking at pitching profit after the 20th round, Jack Flaherty and Walker Buehler outperformed their ADP with strikeouts and ratio support. Sam Grant: I picked up Max Muncy $31 on May 27 after he had hit 6 HR through 99 PA, on the basis on his crazy high 43% Hard% on that date that was fully corroborated by Statcast data like launch angle and xwOBA. On the day of his call-up in mid-June, I snagged Adalberto Mondesi for $21 who I had been monitoring closely all season since I had him in my AL-Only keeper league. Ryan Bloomfield: The search for saves destroyed my early FAAB: Bruce Rondon, Jose Alvarado, Tyler Clippard, Bruce Rondon, and Sam Dyson were among several whiffs. A few 2H acquisitions (Amed Rosario and Jeremy Jeffress) helped me surge down the stretch. Doug Dennis: Norris, Leclerc probably the most helpful. Owners can seemingly always find closers in this format. Ray Murphy: I worked the waiver wire for closers (not very successfully) and OFs (Nimmo and Grichuck were good adds), as well as some back-end starters. Joseph Pytleski: C.J. Cron ($70) was a great acquisition in April while he was productive. Kyle Freeland ($50) in early May was a godsend. I didn't spend much throughout the season, as I probably should have so I gambled and overspent later on Franmil Reyes and Wily Peralta ($325 between the two) to shore up OF and RP respectively. It was too much money, but the FA wire was picked over at that point. Chris Blessing: Brandon Nimmo, Franmil Reyes, and Ramon Laureano were good adds. Brian Rudd: Trading for Kimbrel helped me make up ground in saves, and my two biggest free agent pickups were Miguel Andujar and Marco Gonzales in April. Brad Kullman: My two big FAAB acquisitions were SP Jack Flaherty ($243), who I snagged in week four after somebody dropped him the week before, and Mac Williamson ($344), who I remain convinced was just going to go off before suffering his mysterious concussion, after which he was just never the same. Flaherty was arguably the best SP on my depleted staff. Brant Chesser: Nick Markakis ($30) became a starting OF all season after picking him up in week one. Eduardo Escobar ($49) turned out to be a decent MI add while my team waited on Jorge Polanco to return. Kirby Yates ($77) saved ten games after I picked him up in July. Joe Pytleski (League 7, 13th overall) and Arik Florimonte (League 9, 17th overall) finished second in their respective leagues and in the top 20 overall. 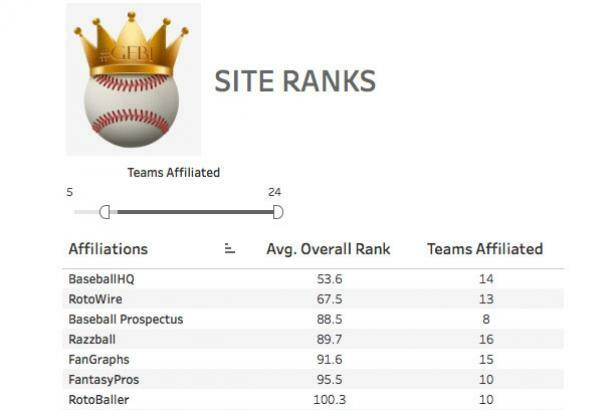 With an average overall rank of 53.6 among all 14 entries, BaseballHQ easily bested RotoWire.com and BaseballProspectus.com for top-site honors. Brian Rudd: My early focus on pitching helped me get 68 of 75 possible pitching points, but not adding an impact bat via trade, not focusing enough on boosting my .260 batting average, and dropping Adalberto Mondesi in June cost me a shot at the overall title. Sam Grant: Excellent middle rounds of my draft more than covered what turned out to be a weak offensive base from my first five hitters. Constant FAAB churn put me in a position to hit on two of the year's breakout fantasy hitters. Brian Slack: I was last in ERA and only had 41.5 pitching points on June 17, but trading for Scherzer and Kluber with Flaherty hitting his stride and Velasquez/Cahill additions boosted my staff. Adding some cheap closers (Romo, Jeffress) filled the void after the Diaz trade. I was very active in the trade market, with seven of my league's 13 trades. Brant Chesser: My team needed more speed to compete for the overall title. Fortunately, my Sale/Cole foundation worked out, and Buehler, Flaherty, and Treinen contributed to the best pitching staff in TGFBI with 937 pitching points overall out of a possible 975 points. Ray Murphy: Rose to the top of the league early on the strength of a strong and balanced offense (Lindor, JRamirez and Story in the infield), ran away with the league for most of the summer, and survived a late fade to hang on. Joe Pytleski: I was competitive in most categories, but my strategy of sacrificing wins for ratios was a little unbalanced. I figured my RPs would make up the difference, but it just didn't happen. I ended up 13th in wins, and a top 13 overall finish isn't bad. Brad Kullman: All hitting, no starting pitching, and a bit short on speed, as well. Ryan Bloomfield: A moral victory, as good things happen when you keep grinding. I was stuck around 150-ish overall (out of 195) through July, but ended up near 90th by the end of the year, and was first place in my league from August through September. Doug Dennis: Loading up on hitters might have given me a shot, but injuries put me back in the middle of the pack to go with weaker pitching to seal my fate. Chris Blessing: Every hitter I touched spent time on the DL. Brian Rudd: In 2019, I plan to wait until the last couple rounds to draft a catcher, as Zunino definitely wasn't worth a 19th round pick in a one-C league. I had multiple minor leaguers/suspended players on the bench for much of the year, which left me short-handed at times, and will probably be something I try to avoid next year. Sam Grant: In the last 10 rounds of the draft, I should focus more on upside than I did in 2018. This is the portion of the roster that will turn over, but I didn't manage to land a player who was much better than replacement level out of this group. Brian Slack: Coming into the season, I wasn't sure how open others would be to trading. Given the general openness to fair trades, I'd be more inclined to emerge from the draft out-of-balance (i.e., more willing to take the best available player rather than team needs, in some spots). Brant Chesser: I need to take a closer look at healthy power/speed guys earlier in drafts, as Wil Myers missing time cost my team counting stats. Instead of drafting a third closer, I would use FAAB for a third closer during the season. Ray Murphy: I had a terrible year with closers all around, and TGFBI was no exception. Something to evaluate in the off-season, in terms of how I approach that population. Joe Pytelski: In the later rounds, I would have drafted more SP gambles and been more active on the waiver wire to find pitching help before I fell too far behind in wins/saves. Brad Kullman: I may need to be a little more aggressive targeting some SP "sleepers," and I need to do a better job of identifying useful speed. I also need to say goodbye to my boy, Miggy. Ryan Bloomfield: Try not to draft down TeamHQ's average! I need to study the "mid-game" in more detail in 2019 to get more value out of Rounds 10-20. The effect of not getting a second closer was disastrous—I took Gregerson in the 17th, then focused way too much in FAAB on replacing him, missing out on several hitter/SP targets. Doug Dennis: Hopefully have better luck selecting top hitters. Chris Blessing: I was too conservative early with my FAAB budget. I bid on the right players but not the right amounts. The only player I bid correctly on in the first half and would up with was Brandon Nimmo. As the season grew longer, I did a better job identifying the right FAAB value on guys. I'd also completely revamp my valuation of pitching. What I used in the 2018 draft didn't work since my staff was miserable throughout the season. BaseballHQ.com staff will undoubtedly be back to defend our individual and overall-site titles in the 2019 TGFBI. Brian Rudd (#2) overall just missed bringing home the individual overall prize... just about the only thing we didn't win here. That is something to aim for in 2019!